Using smoke as a mark-making tool, these drawings are emblematic of the universal paradox; that everything began at a certain point just over 14 billion years ago. Before that there was nothing. 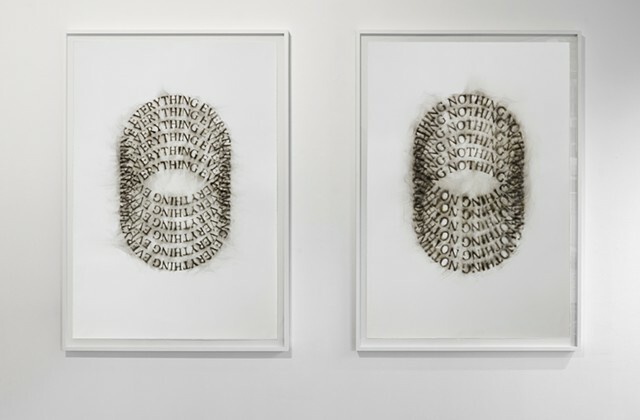 An additional aspect of the work connects to the sooty carbon residue that stains the paper. Carbon is the basic element in the chemistry of all organic compounds, plants and animals. Life develops as a result of the tetravalent properties of carbon and is something that ultimately breaks down and is returned to carbon. So, once again, Everything and Nothing. Finally there are 6 rings in each of the two smoke drawings. There is one ring for each electron (4 outer and 2 inner) in the carbon atom.